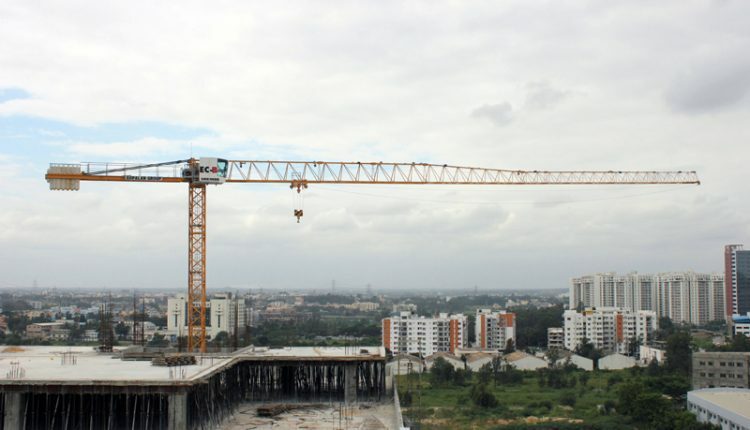 A Liebherr 71 EC-B 5i has been used by Indian realty firm Gopalan Enterprises to help with heavy lifting on the IT Park tower project in Bangalore. Throughout the course of construction, the Liebherr top-slewing crane performed duties such as rebar and concrete pours, helping workers to ‘top out’ the new tower. With its 50m jib and its 48.4m hook height, the Gopalan unit was able to cover almost all of the building’s 97,000ft2 floor plan. By dividing slabs into three separate pours, Gopalan successfully maintained a two-month complete floor cycle; impressive, considering the five-inch slab thickness and 4m floor height. The company praised the Liebherr 71 EC-B 5i’s 2-4 fall wire system. Gopalan operators had previously gained experience using a Liebherr unit with an earlier system, and claim the newest iteration is much improved.